I wanted to let you know this is my last week at Reston Now. I will sign off on Friday. On Tuesday, Nov. 1, I will start work at a new publication (more on that in a bit). I want to thank you all for your readership, engagement and story tips over the last three years. Many of you followed me to Reston Now from Reston Patch when we launched in October of 2013. Local News Now Publisher Scott Brodbeck created Reston Now after I convinced him Reston is a very, very newsy place. More than 5.1 million unique visitors later, he has no doubts. Since launching, we’ve been through countless development applications and the community push to save Reston National Golf Course (they succeeded). 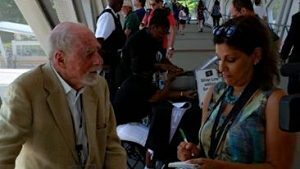 We’ve celebrated as Reston founder Bob Simon reached 100 and then mourned when he peacefully passed away 17 months later. We welcomed Metro’s Silver Line, watched it spur a new era in Reston development, and soon will fondly remember free parking at Reston Town Center. You’ve used your imagination to “fill this space” on dozens of Reston retail vacancies (I am still waiting for a organic cafe/bookstore/children’s play space to wisely open). You’ve sent me breaking news photos, penned op-eds and helped people find their lost pets. I have tried to answer, among other things, why the helicopter is overhead and why your power is out. But it is time to move on. My new job is at the Washington Business Journal, where I will report on economic development. Before working at hyperlocal sites, I spent 23 years at newspapers. I am looking forward to the structure of being back in a newsroom. I’ve lived in Reston for 19 years, so I will still be around town. I will be reading too. I need to know why the chopper is in the sky or what kind of traffic situation is going to mess up my new commute.